A few nights ago I was washing dishes and doing my prayer time for our cell group. Ideally, I like to have time where I’m not multitasking, but as a mom of a little one, sometimes I have very limited time and a very long “must do” list. On the other hand, it is a very good exercise in disciplining your mind. In our previous and current cell group, we have a goal that (except those are not new) everyone prays for our cell group for 15 minutes a day. This is above and beyond our own prayer time and it’s specifically for our cell group. We have a group chat, similar to SMS, that we chime in everyday with a simple “done”. It’s great accountability. I was working on my “done” and praying along, though feeling somewhat down. Two days prior was our cell group night. We had prepared, cleaned, set up and started our pre-meeting prayer time. We kept praying anyway. If no one comes, you don’t just sit around, you pray until someone shows up or otherwise the whole time. Another half an hour of prayer. A member of another cell group came to visit, but she’s a strong believer, so we just continued to pray. Nobody. Our regular members all had things happen or come up. And people we invited were suddenly called into work, etc. It was a disappointment. For me anyhow. And the Lord spoke to me, reminding me, that the only failure would be a failure to be faithful. It’s amazing but, immediately I felt a sense of relief and peace. Faithfulness, that’s all it requires from me. I knew that it was the work of the Holy Spirit and not my work. I knew that it was said to the servant, “Well done, good and faithful servant”. It wasn’t “You did a great job, you really outdid yourself! I’m impressed!” That’s probably more along the lines of what I prefer. In the latter, the focus then is completely on the “you”, whereas in the former, the focus is rather reflexive. Yes, there is acknowledgment of “you”, but it refers to you as a servant, pointing back to the Lord. “Faithful” points back to the Lord as well. And yes, there’s a certain element of “performance”, if you could call it that. But it’s more a diligence and a faithfulness to pray, to let the Holy Spirit move and speak through you, to be sensitive to what the Lord is doing each moment, to obey, to learn the language, to be culturally learned, wise and relevant. But again, that all reflects back to faithfulness and diligence to pray, prepare and obey. The only failure is, in the end, a failure of faithfulness. It takes a lot of the pressure to produce off. Because the Lord’s reminder to me was, again, reflexive. It’s about Him. I just have to be faithful to Him. I have to say that this thought has given more excitement to my prayer time. Mission strategy, mission tools, programs, studies, etc. are all good and extremely useful. But they are not effective without prayer. They are not effective without faithful obedience to the things the Lord shows us… in prayer. It’s a failure, at least long-term. Simple faithfulness in the foundational things with the Lord, combined with resourcefulness and Godly advice, is a guarantee for success. And honestly, as an innate “performance person”, I can get behind this product. The last few days have been really busy with Rosalyn’s birthday party on Saturday. We did a simple style birthday party with elements from Latin culture and American culture. So the food was a lot to do since if it’s latin, it basically has to be made from scratch. But it was a lot of fun. After that on Sunday I started working on a Bible study for a girl who’s interested in becoming a Christian. I think she already believes in Jesus, but she wants to know more about Jesus and the Bible before she actually says it. She even says she’s on her way to becoming a Christian. Anyway, our church uses a book written by a Japanese that really explains things in a way that Japanese can understand. It’s like a 12 step book to reading the Bible. But as it’s written by a Japanese, it’s all in Japanese. So, Sunday was spent in reading it and highlighting words I needed to look up. Monday, I spent 6 hours with a cranky Rosalyn (teething I think, but goodness! I even had to put her in her baby carrier and take her for a walk in the typhoon like rain so she could fall asleep. But she still woke up when we got home! I finally had to turn off the monitor and let her cry it out. 10 minutes later, she was out). But I digress. 6 hours looking up words I didn’t know– not that there were that many- but just that I had to use my laptop to draw in each character, figure out the readings for it, enter the readings into my app on my phone that has a dictionary, then go to the next kanji to do the same and eventually figure out what the word or words meant. Thankfully grammar is not an issue for me. I can understand it and could even understand a lot of it the first time I did the read through. Tonight after the email, I’ll do the final read-through so that I’m prepared for tomorrow. She speaks decent English, but because this is so important, I need to be prepared in Japanese to explain things without sounding like a elementary student. I mean, would you take someone seriously who was trying to share their faith with you, speaking like a 6 year old? I don’t think so. I’d like to think I can manage this at a 7 year old level. Just kidding. Speaking of which, I never filled you in on the tutor and her journey in faith (I say that in faith). So, my study partner gave her the book of Mark which has been translated newly into everyday Japanese language. The previous versions, even Christians sometimes have a really difficult time understanding because it’s in high and lofty language. 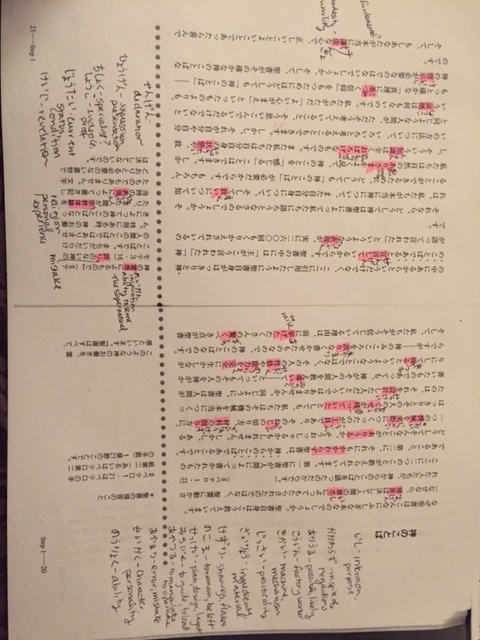 So a bilingual church here (actually the fastest growing church in Japan), one of their translators started working on a new translation for the Japanese. And it’s gotten a lot of great feedback! That’s the background on it. But anyway, a copy was given to her and the next week I had a solo lesson again with her. She mentioned that she had been reading it and was so surprised that it was something so down-to-earth. She said it had a thing in the back, like what to read in such-and-such circumstances, and she had some questions. She wasn’t sure on specifics so I couldn’t answer then and there, but she’s supposed to bring it to a future lesson so we can talk about. To reclaim a little credit for myself, I did already know some of these words, I just didn’t know or remember their kanji. And, imagine 11 pages of this. Today, I just found out that there’s an app that will take a lot of this work off my shoulders. A day late, a dollar short. Oh well, there’s always next week’s study! So, here are some pics of our wonderful trip to Kyoto and Nara. They were supposed to be on the last blog, but it was late and I didn’t have them synced to my computer yet. The wonderful couple we stayed with (our airplane friend’s parents). Here we are at Daigoji, a place they’d never been either, in front of a gate where you “docked your horse”. 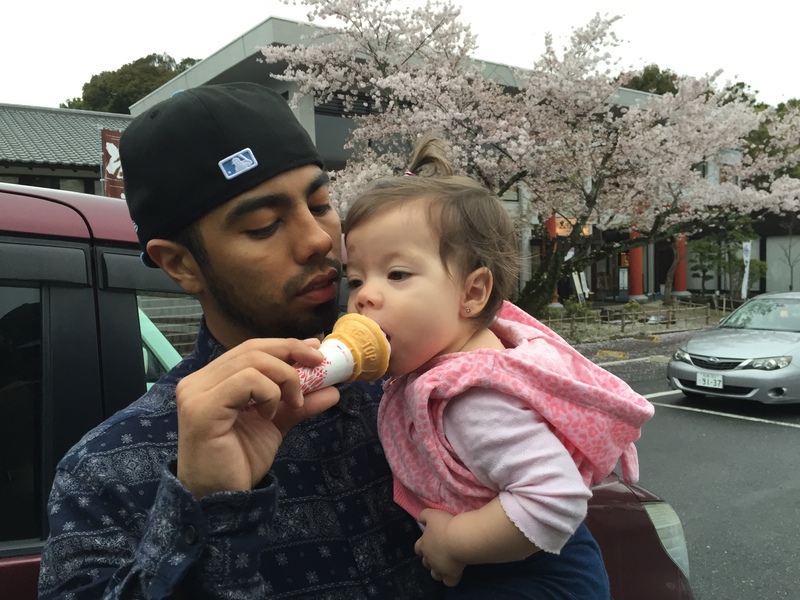 Rosalyn’s first ice cream, “sakura flavored”. I’m not sure how accurate the flavor is, but Rosalyn loved it and seemed to think it was hers instead of us sharing with her. 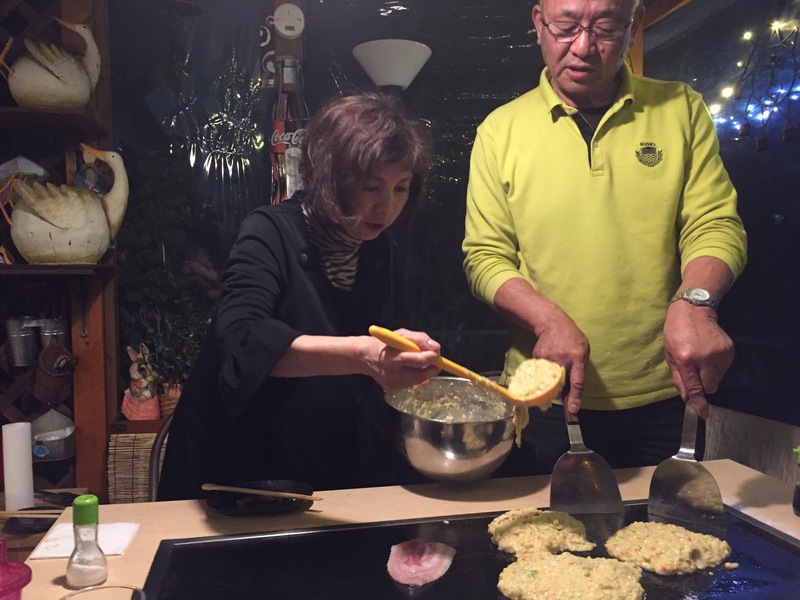 Our hosts made okonomiyaki for us, which had some bacon, lots of cabbage and batter. Think of it as a savory (as compared to sweet) dinner pancake. We even had dinner with their friends! They’re amazing cooks as well and we had a great time using Japanese all night and being in a total Japanese setting. So much of what we do is bilingual, so this was a really great opportunity for us. 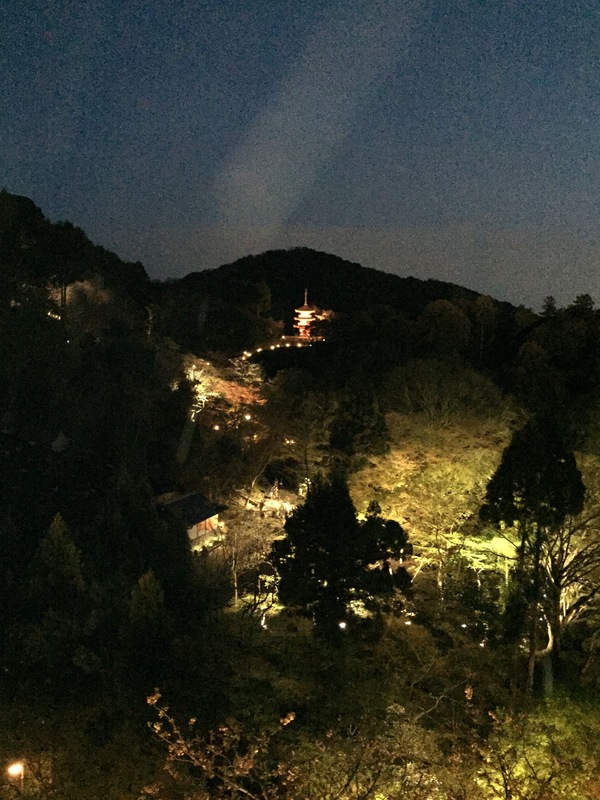 We went to a stunning location called Kiyomizudera, along with everyone else in Japan, it seems. They do a special light up of the spot at night. We climbed a mountain to get here (literally), and with a 20 pound baby sack hanging off you, I was a bit out of breath by the end of it. But the view was worth it! I would love to see it some day converted into a place to offer worship to the true God Jesus! Sometimes, I do feel like we’re standing on opposite sides of an issue, haha! 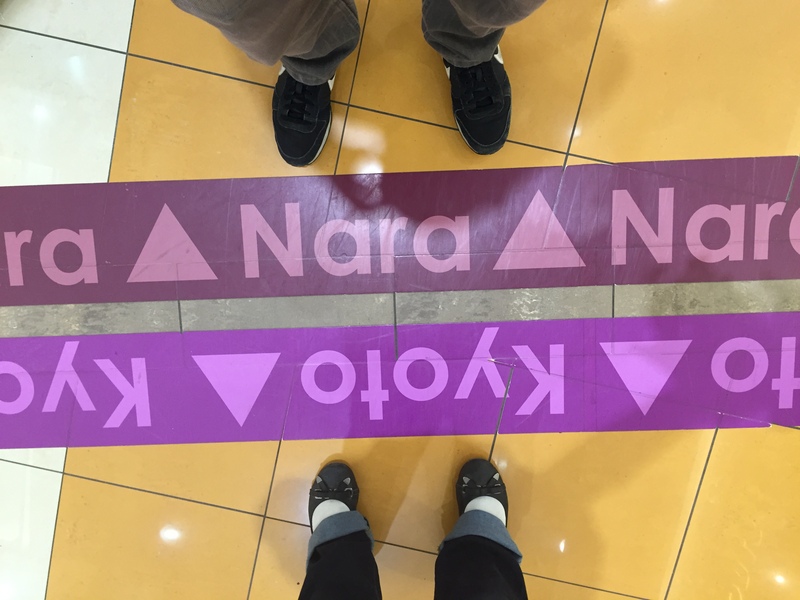 No, we actually were in a shopping mall and there marked the border between the two prefectures. We’re back and on our backs after our absolutely wonderful trip to the historical and beautiful towns of Kyoto and Nara. I loooooooooooove Kyoto. Seriously, it’s my Paris. But back to the story. 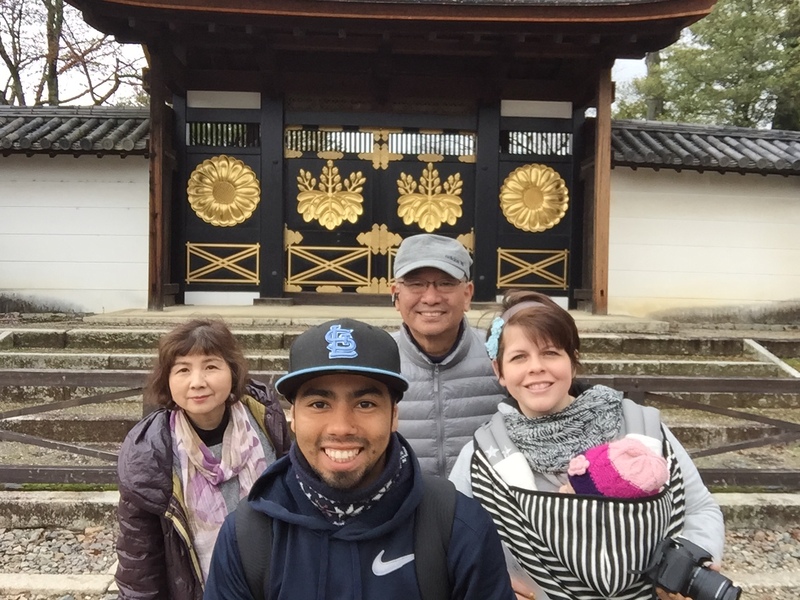 What took us to Kyoto and Nara?? Funny you should ask. Remember our airplane friends we met? Yeah, the ones we met on our flight over here, who have a boy right around the same age as our daughter. The ones who I went over and purposely started a conversation with, even though I never talk to people on the planes? (Yeah, I’m one of those who only say hi, excuse me and bye to those I sit next to for 12 hours). 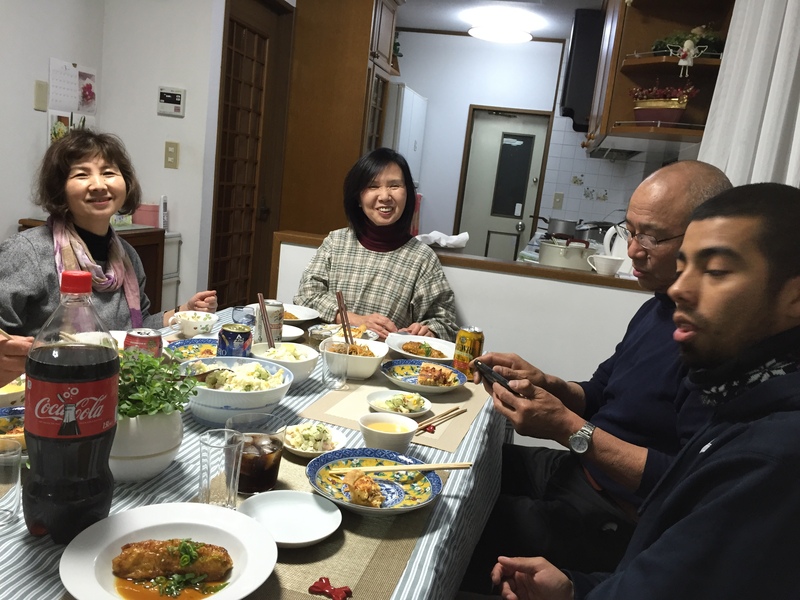 Well, the parents of our airplane friends live in Nara, only 35-40 minutes outside of Kyoto’s center. Long story short, they hosted us, without the presence of their daughter and son-in-law. The father picked us up at the train station and we arrived to a lovely, short and genki mom-like-lady and a house surrounded by hundreds of potted plants, I’m sure. I was suddenly filled with anxiety– Oh no, with all the research I did, I didn’t brush up on house-guest manners! But they were absolutely wonderful people. Yeah, we saw a lot of awesome things during our stay, but better than that, we made some great connections. We visited one place together, a place they’d never visited in their lives, though the mom was from that area. They had a table with a grill in the middle, so we made awesome Japanese food and had lots of conversation. Goodness, we even had dinner at their friends’ house and hung out with them, even though that wasn’t originally in the plans. Did I mention they have a jet-pool tub? We came home with homemade jams and jellies, and leftover bread that she baked fresh every morning. Oh don’t forget the homemade baby food that she made herself for Rosalyn every day. But beyond all these perks, which they’ve invited us to come enjoy multiple times a year, we connected and we have some open doors there. We were able to talk a little about Jesus, and church as well, and want to see these wonderful people come to know their Savior! We’re glad this isn’t a one time meeting, but a chance to really have an impact for the eternal in their lives. This is not coincidence at all!! Well, Vicente is telling me it’s super late and he has to be up early for school. But more on this later.